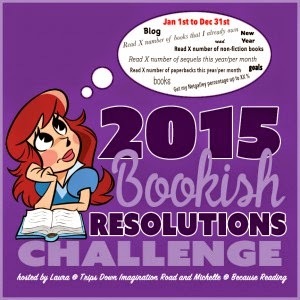 2015 Resolutions & Challenges - How did I do?? December is such a fun month for book blogging and planning. Not only do I get to wrap-up challenges and fill out the ultra-fun end of the year book survey hosted by Perpetual Page Turner, but I also get to scout for new challenges to start the new year in. In 2015, I made a post to track yearly resolutions that weren't stated elsewhere in the blog. The post is here - and the challenge was hosted by Laura @ trips down imagination road and Because Reading is better than real life. So, 2015 is almost done - how did I do this year with my resolutions and challenges? 1. Re-read and review Barbara Michaels books that I have not reviewed before. This goal will be continued into the new year, 2016. I started out strong with this but tapered off. I re-read and reviewed five total. 2. Stay much more active with this site in comparison to 2014. I think I stayed consistent with reviews, planning ahead, a few discussion posts, and a few weekly features. While I wasn't active with a lot of features, I removed several and tried to steamline the site and tighten it up. I did some minor design tweaks. 3. Finish at least 85% of the reading challenges I signed up for. 4. Read a variety of genres every month, which I have struggled with in previous years. While I didn't read everything I wanted to (could have read more romance - again! ), I think I kept myself from being boxed in. I read more mysteries this time, kept up the horror count, read a lot of Urban Fantasy, tossed some romance in there, childrens fiction, series, re-reads, gothics, and overall think it was a successful balance including non-fiction and misc novels. 5. Read most of my own superhero novels and comics/graphic novels. I didn't do as well as I planned, and will continue this to 2016. I did read some, though, so it wasn't totally bad. 6. Read most of the children's books I have on my TBR list/shelf. I meant to do much better in this area. 7. Finally read most of the Harry Potter series and start the Game of Thrones series. I read the first, Game of Thrones, but no more of the series. I also didn't read more of Harry Potter. Overall I bought a reasonable amount of books and cut down. 9. Finish some of the new bookshelves I've been wanting to build when I move the book room to the living room/library. I accomplished MUCH more than I thought I would. We got all the shelves completed, the TV bought and put in, the books up, the trimming basically done, the staining done, all expenses done. The only thing left is the backing (next year) and the trimming details around the electric fireplace. Also have the new coffee table to complete it. Things came together very well - no pictures yet just because I want it to be 100% before showing. 10. Read and return most of the books I've borrowed from my friend.